Every now and again we bring something up from the depths that is really special. 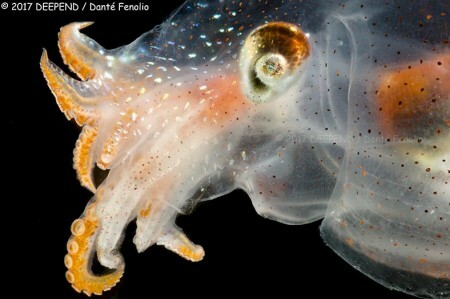 This is the 23rd known specimen of the "Deceitful Dreamer" (Lophodolos indicus). The name, according to fishbase, comes from "describing a deceitful little fish that beguiles its prey with a baited illicium." This is my first time photographing a specimen from this genus. 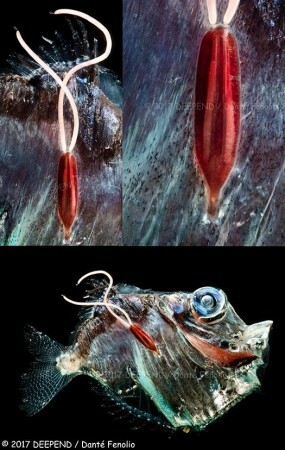 Yes, this fish has a pair of pointy "horns" on its forehead and the illicium is hinged. 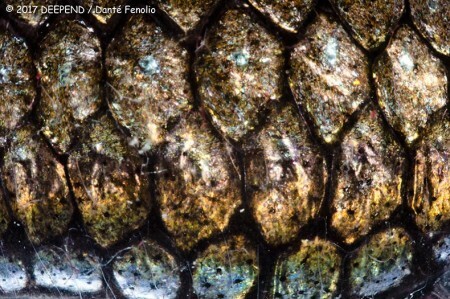 The inset to the lower right is a close up of the esca or "lure." Gulf of Mexico, May 2017. 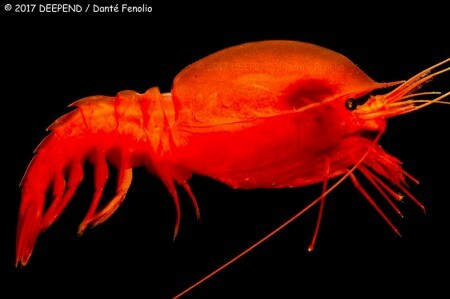 A deep sea shrimp (Oplophorus) ejects a glowing fluid from its body to distract potential predators. This is a defensive mechanism. 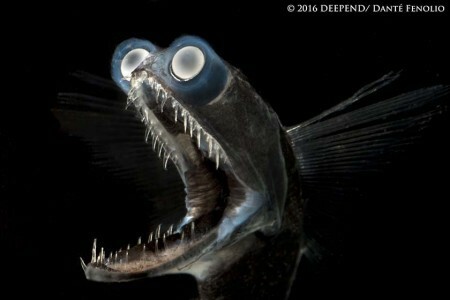 It just doesn't seem like a DEEPEND cruise without a Threadfin Dragonfish (Echiostoma barbatum). 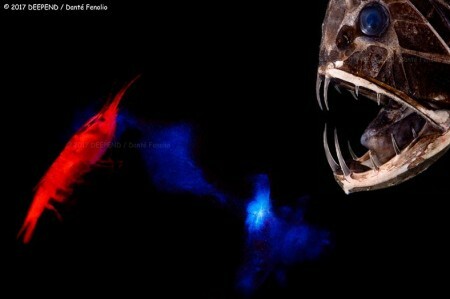 The lure at the end of the barbel glows in the dark. 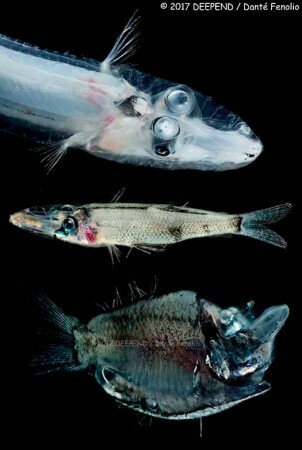 Meet the family Opisthoproctidae (Barreley, Spookfish, and Mirrorbelly) - distinctive fishes. 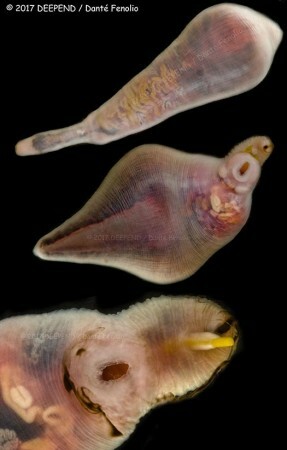 All species have tube shaped eyes and most also have a clear gelatinous tissue surrounding their visual organs. Not a lot of images out there of specimens in good shape. 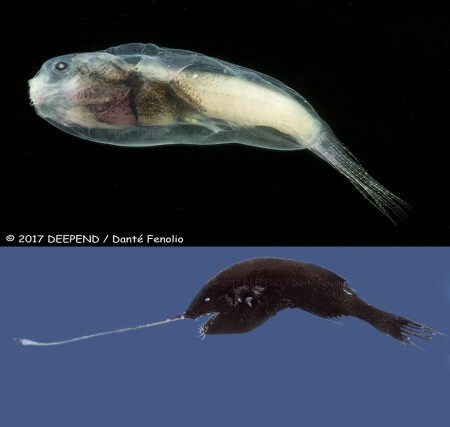 Here are three species we got during DEEPEND cruises: Top- the Brownsnout Spookfish (Dolichopteryx longipes), Middle- the Glasshead Barreleye (Rhynchohyalus natalensis), Bottom – the Mirrorbelly (Monacoa grimaldii). 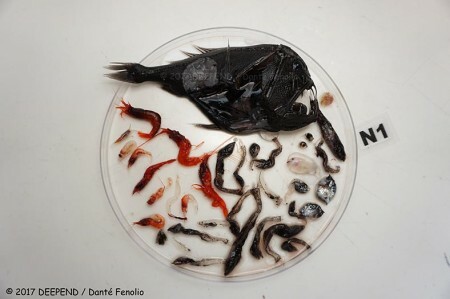 On the phenomenon of "net feeding" - sometimes predatory deep water fishes get into the collection cannister of the net and find a host of potential food items. It is hard to believe that under stress like that, these fishes will feed - but they do. 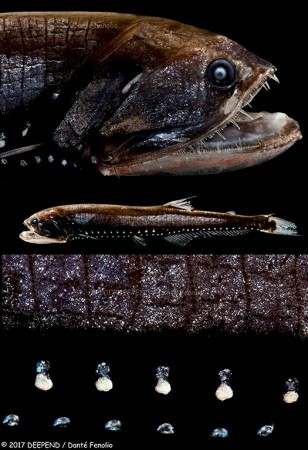 This is a Fangtooth (Anoplogaster cornuta) and all of the items it ate while in the net. Gulf of Mexico, May 2017. Had a pair of Tube-eyes (Stylephorus chordatus) in the nets this morning....love the eys. Gulf of Mexico, May 2017. 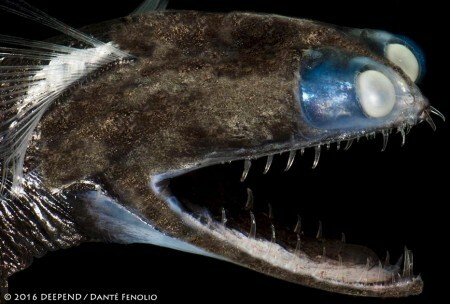 Cocco's lanternfish (Gonichthys cocco). 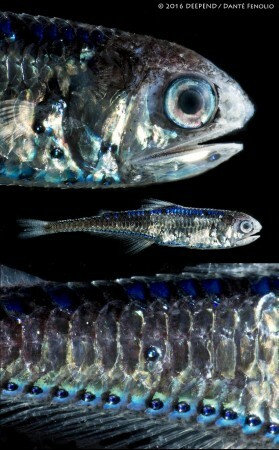 One of my favorite lanternfish. Gulf of Mexico, May 2017. 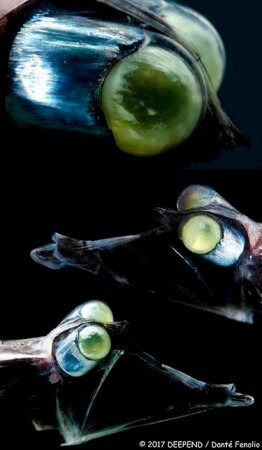 A bioluminescent shrimp (Notostomus gibbosus) - to celebrate National Shrimp Day. 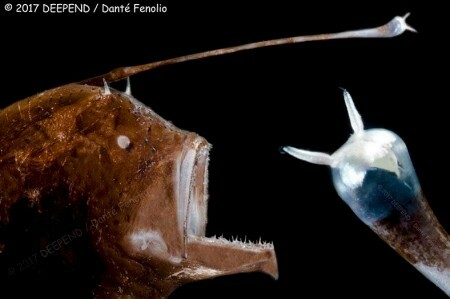 These shrimp can grow to lengths of roughly six inches and eject a glowing cloud of fluid when threatened. They also store ammonia in their carapace to achieve neutral buoyancy. Gulf of Mexico, May 2017. The crew caught a Wahoo (Acanthocybium solandri) from the ship today. 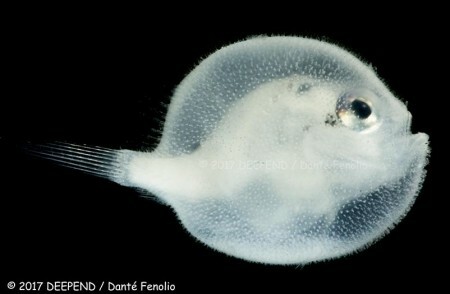 It had a strange ectoparasite (possibly a copepod) at the crease of its pectoral fin and the body. It also had two large stomach flukes in its stomach. Hidden biodiversity.....Gulf of Mexico, May 2017. So you think mosquitoes are bad? 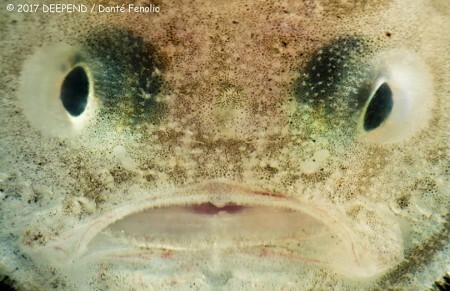 This hatchetfish is having a bad day...more like a bad few weeks to months. We just so happen to have a marine parasite specialist on board with us - Matt Woodstock. 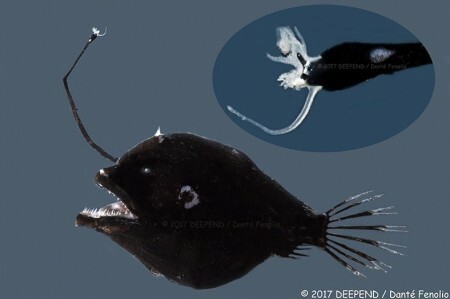 He explained to me that the copepod parasite on the outside of this fish, an ectoparasite, has attached and used its mouth part to pierce the outer wall of the fish. 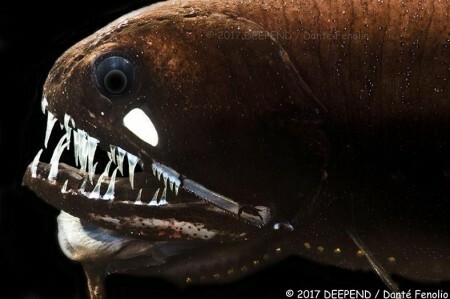 That mouth part then wraps around the internal organs of the fish and specifically pierces the digestive tract - feeding on whatever the fish has fed on. 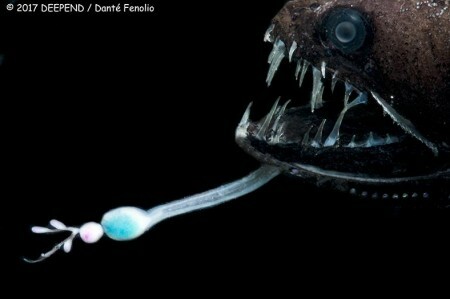 To make matters worse, the mouth part is barbed...this parasite isn't coming off. Ouch! 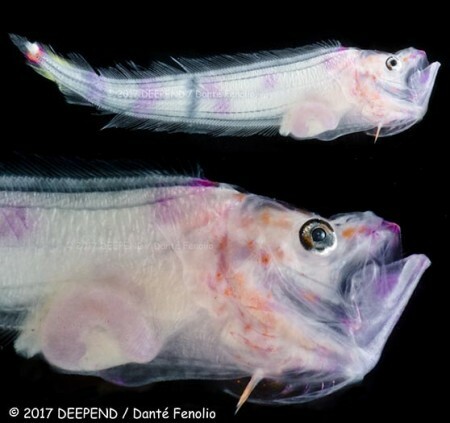 Photographed in the Gulf of Mexico, May 2017.
larval Cusk-eel (Bassozetus sp.) was photographed in the Gulf of Mexico, May 2017. 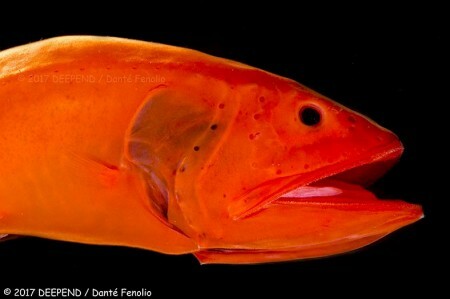 One of the brightest orange/red fish I've ever seen. 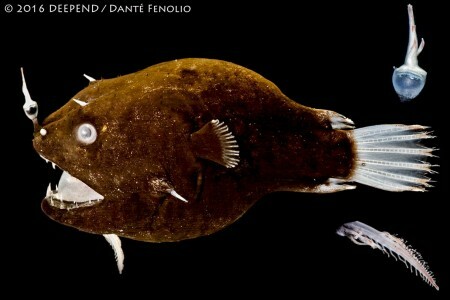 The Velvet Whalefish (Barbourisia rufa) feeds on crustaceans. 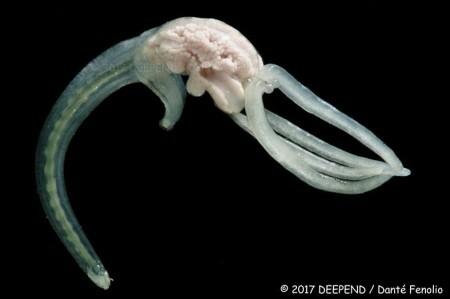 This individual was roughly five inches in total length and was trawled from between 1000 and 1200m depth, Gulf of Mexico, August 2016. The "Diaphanous Pelagic Octopod" (Japetella diaphana) - Gulf of Mexico, May 2017. 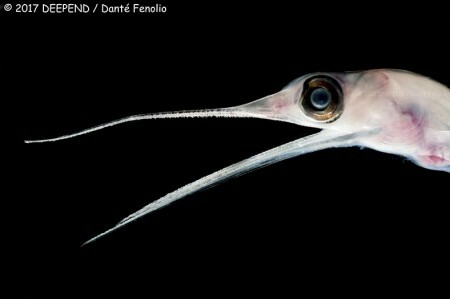 The Snipe Eel (Nemichthys curvirostris) inhabits tropical and subtropical oceans around the world. 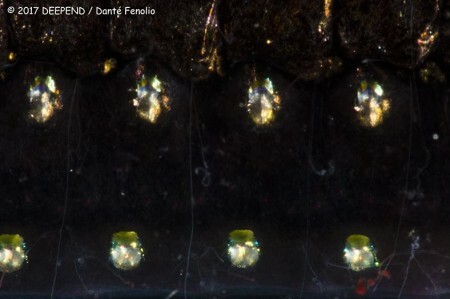 Backward-facing teeth help it catch and devour crustaceans such as prawns and shrimp - the fine teeth might snare the antennae of the crustaceans in the water column. Gulf of Mexico, May 2017.